A cleanroom is a controlled environment where products are manufactured. It is a room in which the concentration of airborne particles is controlled to specified limits. Eliminating sub-micron airborne contamination is really a process of control. These contaminants are generated by people, process, facilities and equipment. They must be continually removed from the air. The level to which these particles need to be removed depends upon the standards required. The most frequently used standard is the Federal Standard 209E. The 209E is a document that establishes standard classes of air cleanliness for airborne particulate levels in cleanrooms and clean zones. Strict rules and procedures are followed to prevent contamination of the product. Contamination is a process or act that causes materials or surfaces to be soiled with contaminating substances. There are two broad categories of surface contaminants: film type and particulates. These contaminants can produce a "killer defect" in a miniature circuit. Film contaminants of only 10 nm (nanometers) can drastically reduce coating adhesion on a wafer or chip. It is widely accepted that particles of 0.5 microns or larger are the target. However, some industries are now targeting smaller particles. They are frequently found in electronics, pharmaceutical, biopharmaceutical, medical device industries and other critical manufacturing environments. It only takes a quick monitor of the air in a cleanroom compared to a typical office building to see the difference. Typical office building air contains from 500,000 to 1,000,000 particles (0.5 microns or larger) per cubic foot of air. A Class 100 cleanroom is designed to never allow more than 100 particles (0.5 microns or larger) per cubic foot of air. Class 1000 and Class 10,000 cleanrooms are designed to limit particles to 1000 and 10,000 respectively. A human hair is about 75-100 microns in diameter. A particle 200 times smaller (0.5 micron) than the human hair can cause major disaster in a cleanroom. Contamination can lead to expensive downtime and increased production costs. Preventing these contaminants from entering the cleanroom environment is the objective. It requires a commitment by everyone entering the cleanroom to make it happen. Mediclean understands the need to be aware of the importance of controlling contaminants. Strict procedures should be followed whenever entering or cleaning a cleanroom. Compromise is not acceptable when cleaning in a cleanroom. HEPA(High Efficiency Particulate Air Filter) - These filters are extremely important for maintaining contamination control. They filter particles as small as 0.3 microns with a 99.97% minimum particle-collective efficiency. What cleaning materials can be used in the cleanroom? When can the cleanroom be cleaned? How frequent does it need to be cleaned? CLEANROOM GARMENTS - The requirements for cleanroom garments will vary from location to location. It is important to know the local garment requirements of the cleanroom management. Gloves, face masks and head covers are standard in nearly every cleanroom environment. Smocks are being used more and more. Jump suits are required in very clean environments. Body Regenerative Processes-- Skin flakes, oils, perspiration and hair. Behavior-- Rate of movement, sneezing and coughing. Attitude-- Work habits and communciation between workers. COMMODITIES - Care is taken when selecting and using commodity items in cleanrooms. Wipers, cleanroom paper and pencils and other supplies that service the cleanroom should be carefully screened and selected. Review of the local cleanroom requirements for approving and taking these items into the cleanroom are essential. In fact, many cleanroom managers will have approval lists of these types of items. COSMETICS - Many cosmetics contain sodium, magnesium, silicon, calcium, potassium or iron. These chemicals can create damaging particles. Cleanroom managers may ban or restrict cosmetics in the cleanroom. This is usually dependent upon the threat to the product being made in the cleanroom. A recent mirror on a space telescope was fogged up from the cologne that was present in the cleanroom. MEASUREMENT AND INSTRUMENTATION - Some important measurements related to contamination control are particle count, air flow & velocity, humidity, temperature and surface cleanliness. Cleanroom managers usually have specific standards and/or instruments to measure these factors. ELECTROSTATIC DISCHARGE (ESD) - When two surfaces rub together an electrical charge can be created. Moving air creates a charge. People touching surfaces or walking across the floor can create a triboelectric charge. Special care is taken to use ESD protective materials to prevent damage from ESD. Cleaning managers should work with their personnel to understand where these conditions may be present and how to prevent them. 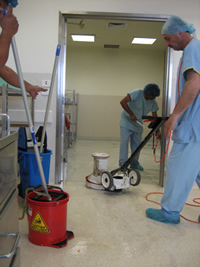 Housekeeping maintenance of the cleanroom and restricted areas is essential to assure quality. 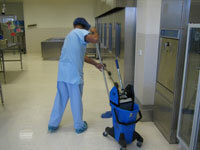 Cleaning of a cleanroom should be performed on a daily basis. Improper cleaning of the cleanroom can lead to contamination and a loss in end user product quality. 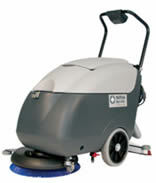 Proper selection of equipment and materials is important for proper cleaning. Only products that have proven cleanroom performance records should be considered for use in cleanrooms. 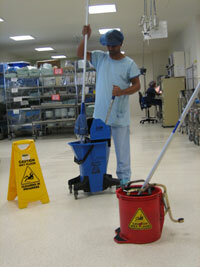 Mediclean understands the need for correct procedures and equipment for cleaning clean rooms. Our products have been designed to assist in maintaining high standards throughout these environments. Mediclean has outlined some guidelines for preparing work procedures and schedules. Local requirements must be included in any cleaning program. 2. Cleanroom mops - mops to be laundried or washed and dried. 3. 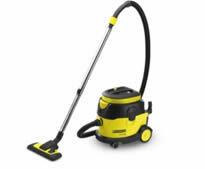 Cleanroom vacuum cleaner A Karacher or equivalent vacuum cleaner with a HEPA filter will be provided to vac all floor surcaes within the cleanroom. 4. Cleanroom wipers - Disposable wipes to be used in the cleaning program. 5. Cleanroom mop bucket and wringer will be designated for the cleanroom environment only and not be used in any other area. Valuable personal Items such as wallets may be permitted in the cleanroom provided they are NEVER removed from beneath the cleanroom garments. NO eating, smoking or gum chewing allowed inside the cleanroom. Only garments approved for the cleanroom should be worn when entering. NO cosmetics shall be worn in the cleanrooms. This includes: rouge, lipstick, eye shadow, eyebrow pencil, mascara, eye liner, false eye lashes, fingernail polish, hair spray, mousse, or the heavy use of aerosols, after shaves and perfumes. Only approved cleanroom paper shall be allowed in the cleanroom. Use of paper or fabric towels are prohibited. Use of hand dryers equipped with HEPA filters are suggested. All tools, containers and fixtures used in the cleaning process should be cleaned to the same degree as the cleanroom surfaces. All of these items are a source of contamination. NO tool should be allowed to rest on the surface of a bench or table. It should be place on a cleanroom wiper. Only cleanroom approved wipers are allowed to be used. The wipers must be approved for the Class of cleanroom being cleaned. NO ONE who is physically ill, especially with respiratory or stomach disorders, may enter a sterile room. This is a good practice in any cleanroom environment. Fast motions such as running, walking fast or horseplay. Sitting or leaning on equipment or work surfaces. Writing on equipment or garments. Removal of items from beneath the cleanroom garments. Wearing the cleanroom garment outside the cleanroom. Wearing torn or soiled garments.